The history of Camp Oglethorpe is largely overshadowed by that of nearby Camp Sumter in Andersonville, Georgia. It exists primarily as a footnote in the telling of Civil War prison narratives. A comprehensive reckoning reveals a saga that brings to light Camp Oglethorpe’s decades-long role as a military training ground for Georgia’s volunteer regiments and as a venue for national agricultural fairs which drew thousands of visitors to Macon. Its proud heritage, however, attracted the attention of leaders of the Confederate government. To the chagrin of Macon’s citizens, the acreage at the foot of Seventh Street was surreptitiously repurposed for brief periods in 1862 and 1864. Although conditions at Camp Oglethorpe never approached the appalling state experienced by POWs at Andersonville, its proximity to and association with Camp Sumter cast a specter-haunted pall over the site. As Central Georgia recovered from the tangible vestiges of war, bitter memories minimized interest in restoring the property to any of its previous incarnations. The deafening sounds of the rail commerce that would eventually be situated there were inadequate to drown out the distressful noise of raw silence. 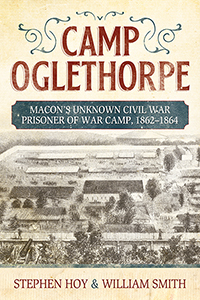 The story of Camp Oglethorpe is predominantly remembered by its association with the atrocities of war as reflected in prisoner-of-war narratives. Indeed, the cries of those who demand to be heard haunt its memory. Smith and Hoy tell this story not only as an admonition to the consciences of humanity, but to illuminate history and paint a more complete recollection of the encampment at the foot of Seventh Street.